But i don't really care because i have that feeling that i might have the chance to pass to the next round if my body height is more than 161cm. ㅋㅋ Coz i feel it, i can see through their eyes when i was standing with others lining up to go inside the room, then i become more sure when i got this question .. (same meaning but different words and punctuation of course) : What is your body height? I answered: 159cm. Then the next question is: What is your opinion about body height? Let's say we're going to have you but there's just one thing which is your body height is below the standard. I answered something like: in my opinion, body height is important but i think there's other more important thing which is personality and character. I think it's not a smart answer coz one of them replied, "But you know, in this industry, safety is #1." Then i just nodded. Yesterday evening i was waiting for my auntie at Terminal 2D arrival gate of Soekarno Hatta Airport. There's a plane which did landing first before the plane where my auntie was in. 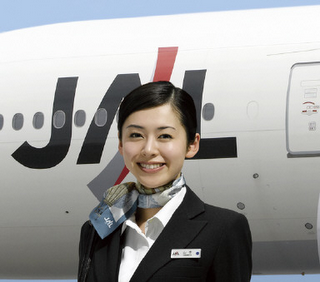 And the plane is Japan Airlines (JAL). So... JAL passengers and flight attendants went out before my auntie. Pretty Japanese girls went by. They are so white, their eyebrows are so nice, and their smile are so bright.